But what if people are by and large only traveling to the same places? Our newest map highlights the countries with thriving international tourism industries, and it suggests a dramatic disparity between the places where tourists spend big bucks and the places where they hardly spend anything at all. We got the data for our visualization through the World Tourism Organization, an agency in the UN. First, we color-coded each country based on the continent. Then we adjusted the size to correspond to the annual amount tourists spend in each destination in 2017 (US$ B). The WTO defines an expenditure as any amount spent by an international inbound tourist, including things like transportation, goods, and services. In other words, our figures exclude domestic tourism, giving you an accurate snapshot of which countries depend the most (and least) on the international tourism market. There are several significant insights about the worldwide tourism industry in our visualization. 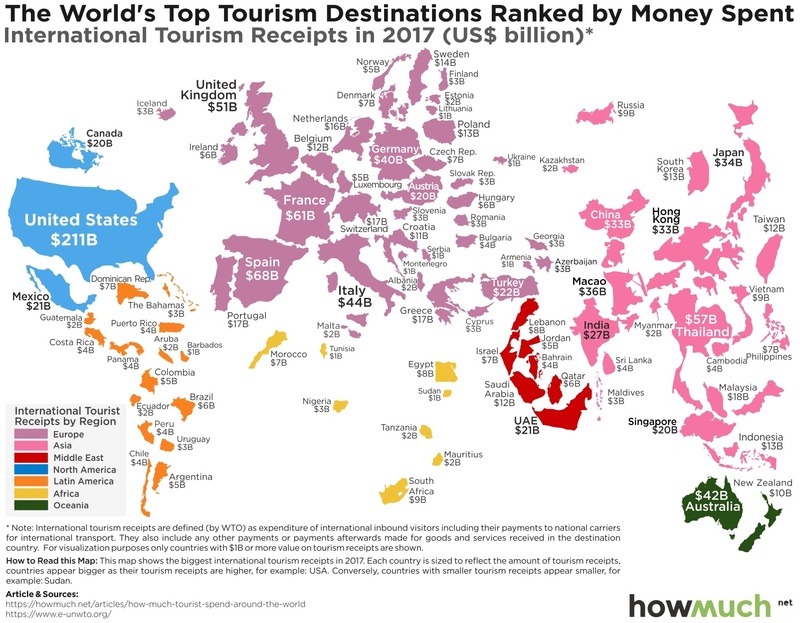 The most obvious conclusion one can immediately draw is which countries see the most (and least) tourism dollars, looking both at continents and individual countries. Take Africa and the Middle East, for example. Only a handful of countries have tourism industries large enough to appear on our visual. Compare that to the size of the US, which is more than double the combined size of both areas. The US alone actually accounts for 16% of the entire world’s tourist expenditures ($211B), and the combined value of the top ten countries on our list make up an amazing 49% ($643B). This means that the tourism sector is top heavy and concentrated in a few key places. In fact, the places attracting the most money tend to be Western countries, plus a few East Asian hotspots like Japan, Thailand and Macao (which is an independent territory controlled by China; more on Macao in one second). Comparatively little expenditures take place in the global south, including South America. The notable exceptions are Australia ($42B) and New Zealand ($10B), but both of those are developed English-speaking countries. This raises interesting questions about the global travel industry. Airlines fly all over the world, and yet the tourism industry is bifurcated and unequal. How can unknown places attract visitors who spend money? Macao offers an instructive example. It’s an obvious standout on the map at $36B. And that’s because it’s the largest gambling hub in the world. Typhoon Mangkhut recently forced all of Macao’s casinos to close, and in just 33 hours, the entire industry saw a combined loss of revenue of an astonishing $186 million. That comes out to $5.6 million in lost revenue per hour, every hour. Gambling might not be the ideal way for every country to develop a robust tourism industry, but the money sure speaks for itself.